Like most of us, I am addicted to my phone. When I am feeling weak, tired, bored, bothered, vulnerable, insecure, I reach for Instagram or WhatsApp or some similar miniature Pandora’s box, and look for validation. I want to reaffirm that I am happy! I have fun! I am cool! People love me, don’t they? I don’t have a healthy relationship with either of my parents. I haven’t received much in the way of warmth, affection, praise, approval, support or recognition from either of them. I don’t even think it was anything exceptionally outside of the norm, and that’s why it has always been easy throughout my life to find relationships that mirror these patterns of dysfunction. In the past, if you were to praise me or show me warmth, I didn’t trust that interaction: you must only be praising me because you don’t really know me; you are only being warm to me because you want something from me. If you were cold, distant, manipulative, diminishing, undervaluing however, I trusted that. That felt familiar, it felt natural, it felt correct. I welcomed it. Not that my relationships have been out and out abusive; not that I have not shared many wonderful times with many wonderful people; not that the significant relationships in my life have not been with good people with good hearts, as I believe myself to be. But just let’s explore the perspective that even among fundamentally good people, there is a spectrum of what is healthy in relationships and I believe as many, if not more, of us fall into the unhealthy end of that spectrum than the healthy end. That dysfunction comes more naturally to us than we might be ready to recognize. In writing my Empowered Woman book, I did endless research around hormones, and one of the many fascinating nuggets that I uncovered (many more of which you can find if you choose to purchase the eBook. ), was that the release of dopamine blocks the uptake of serotonin. Succinctly put, dopamine is pleasure and serotonin is happiness, and so what our biochemistry is teaching us is that the more we seek the short-term pleasures in life, the more we are depriving ourselves of long-term happiness. Social media, very obviously, falls into the category of something that creates a highly addictive dopamine release, and prevents us accessing the serotonin that we seek. So, knowing that I was picking up my phone in order to receive validation, and knowing also that I was never going to receive the rewards that I was looking for from my phone, I began to question why I felt I needed validating, and how then could I actually get it. Again (quite obviously once you stop to think about it), I came to the conclusion that only I could validate myself in a way that would actually be fulfilling. So when the urge to pick up the phone for that dopamine hit comes on, I pick it up and instead of opening Insta (OK, sometimes after opening Insta and having a quick look just for one minute), I open the camera, I turn it on myself, I put the video on, and I talk to myself. I say hello to myself. Oh look, there I am! Not in the past or the future or with this person or that person, I am in my body right here and now. And then I just say whatever’s on my mind. The funny thing is, whatever’s on my mind nearly always isn’t what I thought it was. Sometimes the videos end up being a minute, sometimes ten. Most of the time it’s very quick and simple to see what I’m getting hung up about and how I should get over myself. Most of the time it sounds silly once I say it out loud, and I laugh at myself. And I tell myself that I love myself. That I am beautiful, special, amazing, wonderful. All the things I never heard from my parents, so I had a hard time accepting from anyone else. I keep the videos, and I watch them back when I feel I need them. Sometimes I delete them later in the day, sometimes a few days later, some of them end up being pretty wonderful and I save them. A lot of times it’s funny to see what I was bothered about a week ago and how it’s passed. It’s not really about the videos themselves, it’s about the way it makes me feel to see someone saying nice things right to my face. It’s about learning to trust and believe that that’s they way that I am treated in life, as a person who is loved and is listened to at all times, and who matters unconditionally. When I was younger, if you told me I was beautiful, I knew you were wrong. I didn’t know that I deserved love, my default was that I deserved to be ignored and neglected, and if you thought otherwise I was sure you were mistaken. Re-reading this back it sounds very harsh spelt out in black and white, so I want to make it fully clear, this isn’t a victim story. This is how I believe the majority of us were raised to think about ourselves. 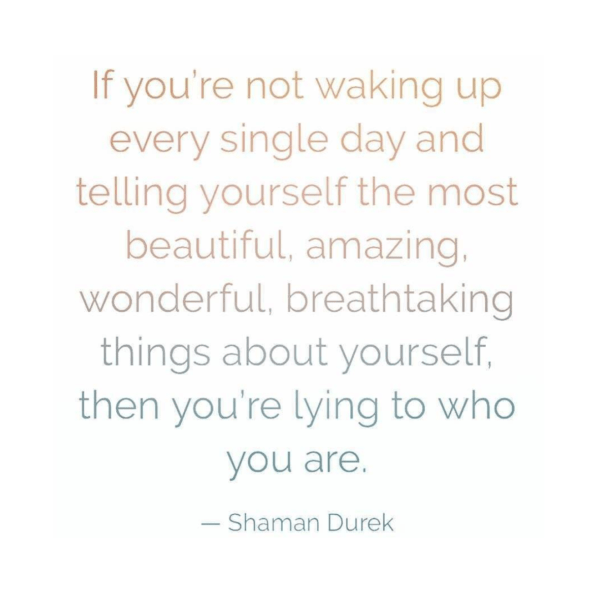 It’s hard to come out and admit these things and that’s where the urge to cover up the deepest darkest truths about ourselves comes from with endless selfies and social media pretence. You may view it as narcissistic that I spend time making videos telling myself how wonderful I am, but to me it’s a healthy coping mechanism that makes me feel better in a world that too often feels deeply messed up. So much of the time, we go on social media to escape the messed-upness of reality, but what we’re learning is that the virtual world we inhabit isn’t any more functional, and so we end up more deeply immersed in what we are trying to distract ourselves from. Talking to myself truly heals the validation-seeking cycle: it’s free, it doesn’t harm anyone, and it works, which is more than you can say for the majority of coping mechanisms that people choose to employ. I think of loving myself and making myself happy as my most important job. I used to think it was my job to save the world and make everyone else happy. That was really stressful! I put a lot of pressure on myself to do that. Every year I would be disappointed that the world hadn’t been saved yet and I had to work harder next year. It was pretty exhausting and also worrying to put that kind of burden on my shoulders. I guess more than anything, it was the feeling of failure I experienced when people didn’t want saving. If you don’t need my help, who am I? My sense of self was based in the fact that I did good things for people, not that I was lovable and acceptable just as I was without needing to prove that to you. I know that being alive is in itself a magical experience, this life is a blessing, and every creature under the sun is of equal importance. I don’t need to do anything to earn your love. I don’t need to have perfect nails, or reply to your email instantly, or always arrive on time, or dress a certain way, or tell you things to make you happy. When the innate bliss of life as our birthright is our primary belief system, it’s so much easier to spot abusive relationships and nip them in the bud before we end up house-sharing with them, working for them, dating them or even married to them. The central foundation stone of my life is that I am a wonderful person who deserves love and so when anyone tries to enter my orbit who doesn’t share that vision of myself, I can send them packing a lot quicker. Through relying on my personal media not my social media, I am used to hearing that I am beautiful. I am used to hearing someone say I love you, and so the people I allow in must be in alignment with that self-love that exists in my core. I feel so much better now I use my phone for self-love not seeking love. I am so relieved to know when I wake up in the morning that I base my days around being kind to myself and putting myself first. It’s so much more straight-forward to spot the seeds of abusive behaviour in other people and step away from that treatment. It’s so much more wonderful to be around people who are also drawing from a deep well of self-love and not acting out patterns of behaviour in order to make me responsible for their happiness, or expecting me to do the same. I think self-love is a hard thing to talk about because it has to begin with honestly looking at the ways in which we don’t love ourselves. In our world of appearances, being seen to be cool, popular, and happy is all-important, so admitting the vulnerability of what lies behind that veneer of superficiality isn’t easy. 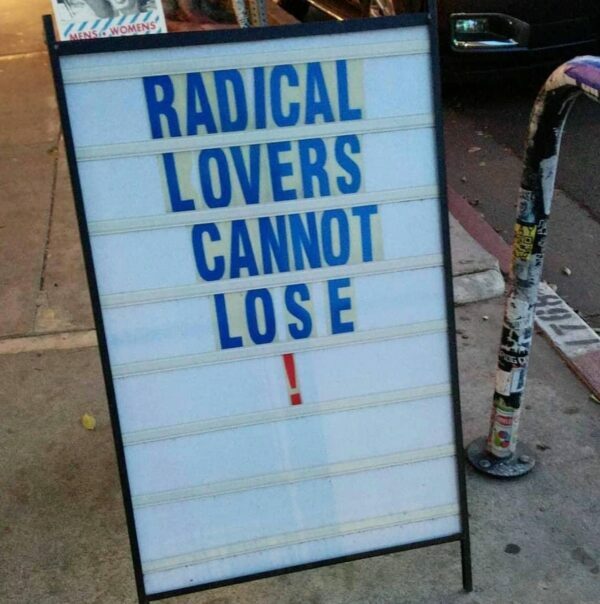 But radical self-love is the starting point for all the changes we need so urgently to see; radical self-love is an end to racism, sexism, all the isms, all the wars and all the violence, because when we love ourselves so fully and completely we stop allowing the micro-aggressions that in turn fuel the macro-aggressions. Self-love is about the way we treat ourselves, it’s about how we prioritise our lives, and ensuring that we fit in adequate rest and play as well as work. But more than anything, I think it’s about the way we talk to ourselves, it’s about our inner dialogue. Do we know unequivocally that we are worthy of love, that we don’t need to do anything to seek it, but that by simply tuning into that divine presence within, we can tap into its infinite source and thereby attract in everything we desire? Are we sure that we are enough as we are, and are we connected to that fullness of spirit, and a deep sense of gratitude that comes with the profound awareness of the abundance of the universe? This is what I search for on a daily basis: not the material distractions, but the ability to enter into an energetic space that not only feels wonderful, but also delivers all my dreams and more. Totally resonate with your experience in early life and what it informed/ taught you to believe about yourself. I met you in Bath teaching the Advanced raw living course. From that time I felt the gift of love you have been teaching yourself radiate from within you , outwards. This article and all that you produce is yet another inspiring example of what is possible when as individuals we allow the honest voice of self love to flow . I have recently brought both your books; Raw Magic and Raw living. My life is forever changed. You are a true gift and I am so thankful for all of your efforts. I really like your idea of the mini videos. I’m going to give it a try.